At CPS curriculum plays a very important role as we at CPS believe that learning is not just about teaching, books and lesson but much more than that. The School provides ample scope for the enrichment of the social and cultural life of Pupils. It is beyond the class room that a student's character is really developed. The cultural life of the school is rich and varied. The seeds are sown within the curriculum. At CPS the emphasize is more on the overall development of the child,as we understand that schooling is the time in the life of every child, which influences their future. To do this, creation of world-class infrastructure facilities and a favorable atmosphere is a sine-qua-non for any child to learn not just academics but lessons of life,character,ethics and values. At we impart all these qualities in the children so that they emerge as responsible individuals. CPS has a curriculum that is integrated. the curriculum is concept oriented rather than exam oriented. 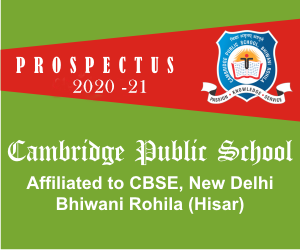 at cps the curriculum is designed keeping in view the overall development of a child. The classroom is nerve center of the activities that are undertaken in shaping and grooming the leader of tomorrow. The integrated curriculum not only concentrates on the academic but also on the qualitative development of every individual child. The school follows NCERT text books from class VI-XII.In case of non availability of NCERT books on time, we have no option but to follow books of private publications. Cutting& Pasting, Paper Folding, Drawing & Painting, Paper Tearing &Pasting, Dramatization,Recitation of Rhymes with Actions, Folk Dances, Indian& Western Music,Fancy Dress, Clay Molding, Mask Making etc. OutdoorActivities: Group Games,Gardening & Water Games.